After many years of using VirtualBox as my preferred virtual desktop hosting software for development VMs I ran into a new-for-me issue: Internet Explorer's page display would become exceedingly slow to respond to changes within a few seconds of loading. Refreshing the page did not help. Opening a new tab repeated the process: slow page response a few seconds after the completion of page load. Chrome and Firefox had no issues. A peek under the page request/response covers using Fiddler did not reveal anything amiss. Clearing cache, history and just about everything else safely deletable (via CCleaner) had no impact. I then tackled the VM's VirtualBox configuration. I verified the virtual acceleration options were still enabled as they should be. My problem VM had plenty of disk space remaining and plenty of actual host machine disk space to support it -- storage allocation was not a factor. I tried doubling available RAM. I increased available CPU cores from 2 to 4. I decreased available cores from 4 down to just 1. Nothing made a difference. Finally I worked my way around to graphics settings. Adjusting graphics memory did not help. But, ahhhhhh... enabling 2D acceleration did the trick. Almost. In all the years I've used virtual machines for my development environments I'd never *needed* to enable 2D acceleration. In this case 2D acceleration fixed my IE problem but introduced a different problem: the second virtual screen in my VM (yes, your VM can display multiple virtual screens across your multiple physical monitors) would sometimes become exceedingly slow to respond. Not just IE this time but all windows were slow to respond. Move a window into the first virtual screen and all was well. Move it into the second screen and it would take many long seconds -- sometimes minutes -- to refresh. 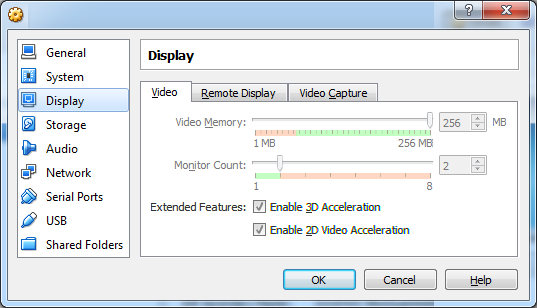 I also enabled 3D acceleration, something else I'd never needed to do for a VirtualBox-hosted VM. 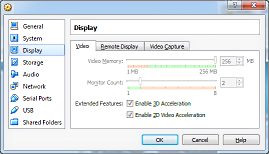 With both 2D and 3D acceleration enabled the VM's window refresh performance was back to normal on all of my virtual/physical screens.